Plumbing Questions—Answered! | Carroll Plumbing & Heating Inc.
At Carroll Plumbing & Heating Inc. we’re impressed with how many of our customers have a good knowledge and understanding of their plumbing and HVAC systems. However, we all stumble upon questions or concerns at some point that lead us in search for more information. Aside from basic maintenance tasks, plumbing is unfamiliar to most homeowners. Pipes, lines, tanks and other components of this complex network are all hidden underground, behind walls and beneath fixtures. This makes troubleshooting a real challenge if you don’t know what you’re doing. Hiring a plumber is the best choice you can make in getting to the bottom of problems that lurk within your system. What you’re experiencing could be a quick, inexpensive fix, or it could indicate a problem going on elsewhere in the system. Any plumbing concern is worth attention since letting it go can impact water bills, equipment performance and overall home safety and efficiency. Q: How can I prevent frozen pipes? A: This is an important one that we start getting asked more as Fall approaches. Pipes that are most susceptible to freezing aren’t just those located outdoors, but water supply lines in unheated interior areas and pipes with little or no insulation that run against exterior walls. Places like basements, attics, crawlspaces, garages and kitchen cabinets are where you should be concerned about frozen pipes. Before temperatures drop, these pipes should be insulated with products like insulating foam or wrap. On very cold nights, leave faucets on a slow drip and keep your thermostat temperature consistent with daytime settings. Q: Why don’t I ever seem to have enough hot water? A: This question has multiple answers. When it feels like there isn’t enough hot water, take note of whether there’s another appliance or plumbing fixture running—like a dishwasher, clothes washer or shower. Using various hot water appliances simultaneously is an easy answer. If that’s not the case, check the temperature on your water heater. Recommended water heater settings are between 120-130°. There’s also a chance your water heater isn’t sized properly for your home. Equipment replacement, upgrade or second heater can be installed to better meet your family’s hot water needs. Q: Why does it sound like my pipes are knocking together? A: Knocking pipes occur because of variable water pressure in your main supply line. Pressure is necessary to keep water flowing between pipes and faucets. However, when the pressurized air that’s used to prompt water flow is low or leaky, water moves more rapidly causing the knocking sound as it moves through the pipes. Although this isn’t a major concern, the noises are a nuisance. 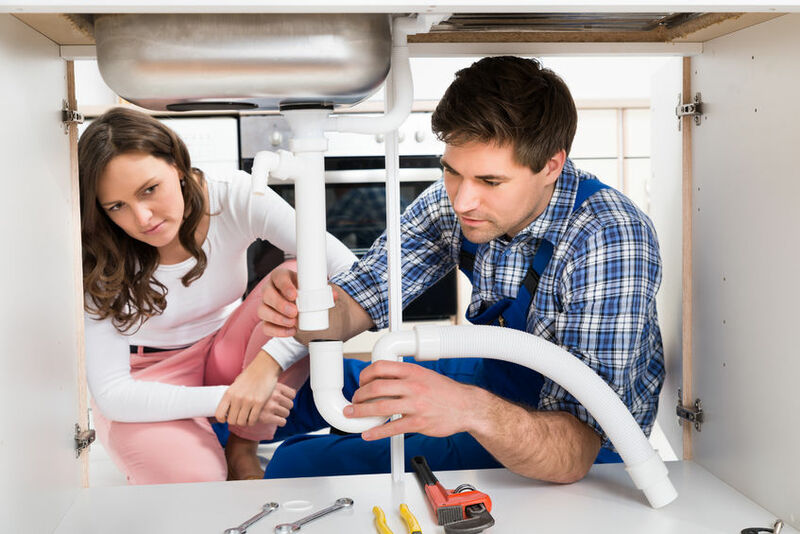 Depending on how old the plumbing system, you can combat the problem a number of ways, like installing water hammer arrestors, draining the pipes, tightening connections or replacing pipe fittings. Q: Why did my water bill skyrocket? A: It’s typical for your water bill to hover around the same amount each month. Of course this varies based on how often you used the sprinkler, or the amount of laundry and dishes you washed, but it shouldn’t be a drastic difference. What’s not normal is a sudden increase in your water bill. This requires immediate attention because it can signify an active leak somewhere in your plumbing. Inspect all faucets for drips and make sure the toilet isn’t running when it’s not in use. Check appliances, particularly your water heater, for leaks as well. Look for damp spots on the walls, floors and ceilings that might pinpoint the leak’s location. Q: Why is there a gurgling sound coming from my sink? A: Gurgling noises coming from any plumbing fixture are a sign of a blockage—and it’s not necessarily in your drain. More often than not, the blockage is in the vent that supplies air to the drain. Gurgling noises are the result of air becoming lodged in the line. Depending on where vents are located they may be malfunctioning; they may not even be installed in proper locations. Unless every fixture has a vent to provide proper ventilation, the air blockages (and gurgling) aren’t going anywhere. The technicians at Carroll Plumbing & Heating Inc. can easily take care of any of these residential plumbing repairs and much more. Although there are some jobs you can attempt to troubleshoot to a degree, most plumbing repairs are best left to a professional. Assistance with anything from minor repairs to major emergencies—you can depend on us to keep your home safe, comfortable and efficient. For answers to all your plumbing questions, or to schedule service, contact Carroll Plumbing & Heating Inc. today!